OutRun 2006 Coast to Coast is the latest edition of the extremely popular Outrun series that was spawned during the 1980's. Since its original incarnation, there have been many sequels but most failed to capture the true spirit of the first title but this current edition is easily the best of the mythos. Once again your beautiful girlfriend returns on another thrilling spin through the Outrun universe that this includes a few left spins such as UFO's and even beach balls. The gameplay of OutRun 2006 Coast to Coast is simplicity at its best and the object of the game is to finish the race by not only beating the clock but also your own personal best. Apart from racing at ridiculous high speeds, gamers can also perform a variety of maneuvers from slides, spins, drifts and even shimmies. 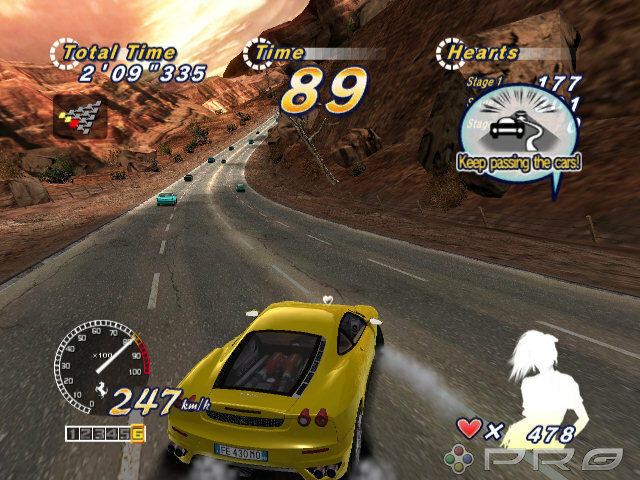 Apart from the stock standard gameplay arcade mode, the developers have also included an interesting game mode called "Heart Attack" that throws a variety of mini-car quests at the gamer that they complete before the time expires. In addition to the new "Heart Attack" mode, OutRun also features a great multiplayer mode that allows gamers to race their friends and enemies in some of the best darn multiplayer racing fun. 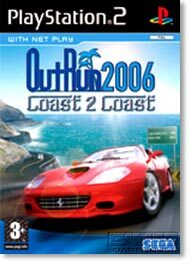 Similar to the original game, OutRun 2006 Coast to Coast features 15 varied and different stages that challenges gamers of all different levels as they race against the clock. Ironically, many of the features of the first game have returned and players must also select which route their Ferrari shall take, with one alternative focusing on ease with the other on difficulty but with a faster time. To make matters more exciting or frustrating... the player is pitted against a plethora of obstacles that not only include other traffic but also environmental obstacles. 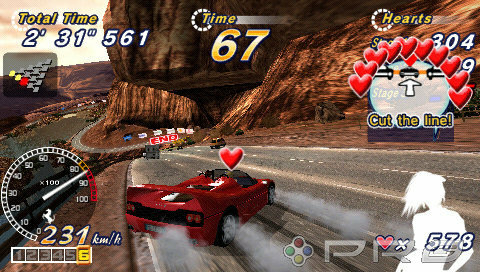 The control system of OutRun 2006 is a joy on the Playstation 2 with the analog and D-Pad used to control the car within the gaming world. Unlike the more serious racers on the market at the moment, OutRun 2006 is pure entertainment that not only allows the novice gamer to pick it up in no time but also gives more experiences gamers a true run for their money. OutRun 2006 Coast to Coast also features a myriad of unlockable goodies such as new cars, tracks and even music. In order to unlock these new features, players must accumulate OutRun miles that basically monitors the player through whatever endeavors the engage in during the game which truly enhances the gameplay factor. Graphically, OutRun 2006 is a visual treat on the PlayStation 2 and features exceptionally sharp and colorful graphics. Match that with detailed polygons with a plethora of special effects from lighting, reflective surfaces and smoke effects and you have a visually impressive title. It should also be noted that the background environments are extremely detailed and although not appearing too realistic are a "tad" cartoony that pays homage to the colorful universe of OutRun. As with the graphics, the sound effects and musical score have been professionally implemented into the game that go hand-in-hand with the graphic system. If you're expecting a realistic racer, then you better look elsewhere because OutRun 2006 Coast to Coast is as about as "arcadey" as you can get, without taking itself too seriously. Great graphics, addictive game and just pure adrenaline pumping fun, this game should please just about everyone!